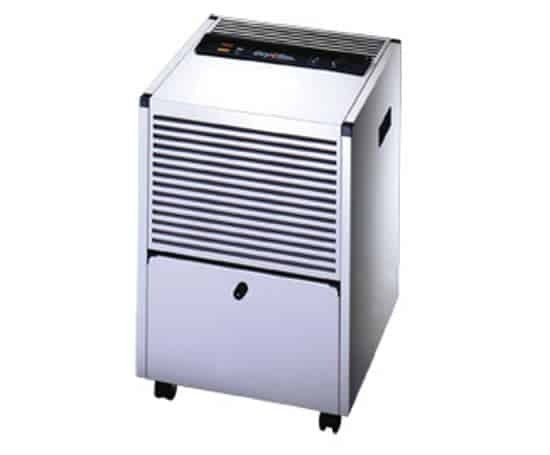 The DryClim portable dehumidifier is suitable for removing excess humidity in domestic and small commercial environments. Typical applications include offices, museums, libraries, paper deposits, photographic laboratories and private homes. Various models are available that can remove from 13-27kg/day of moisture. • High operating efficiency with maximum energy savings due to an automatic defrost, which eliminates ice on the evaporator. • Compact dimensions due to the condensation tank being accessible from the front of the unit, and flow of the inlet and outlet air from the front.